Explanation: The purpose of this is to combine template languages such as PHP, EmbPerl, Mason etc with any other syntax highlighting on the fly, as opposed to the current practice which requires a combined set of files to be generated at build time. This is only done for the HTML + PHP combination, so with the new way a multitude of combination becomes available. In addition to that, nothing needs to be regenerated when a highlight is updated, makeing it much easier for users to keep their highlightings updated. avoid message boxes by using it, this won’t influence the workflow! In April there will be a Kate Developer Sprint, similar to previous sprints for Decibel, Akonadi, KDevelop and others. This is a great opportunity as developers interested in development of KDE’s text editor will discuss what to do to make Kate the best text editor on earth. 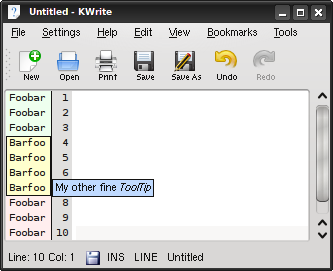 This also means lots of polishing so that Kate in KDE 4.1 will shine even more! The meeting will take place from 2008-04-11 till 2008-04-13. The location is hosted by basysKom in Darmstadt, Germany. Many thanks goes especially to the KDE e.V. for their financial support. If you are interested in Kate development, join our mailing list. More to come, stay tuned! The event is organized by Dominik Haumann, and is supported by the kde.ev. On the agenda is discussing Kates future development and improving scripting capabilities amongst others.